I think most gardeners are somewhat crafty people, and if you grow herbs in your garden and if you like to dry and store them, why not make your own herbal tea bath bags? I’ve been doing it for years, and thought maybe it would be something interesting to share with everyone. My Grandma always used Epsom salts, speaking highly of their virtues. Being a bath person myself, I started adding Epsom salt, sea salt, and various dried herbs in muslin bags, tying the bag to the tap as the bath water runs through it. 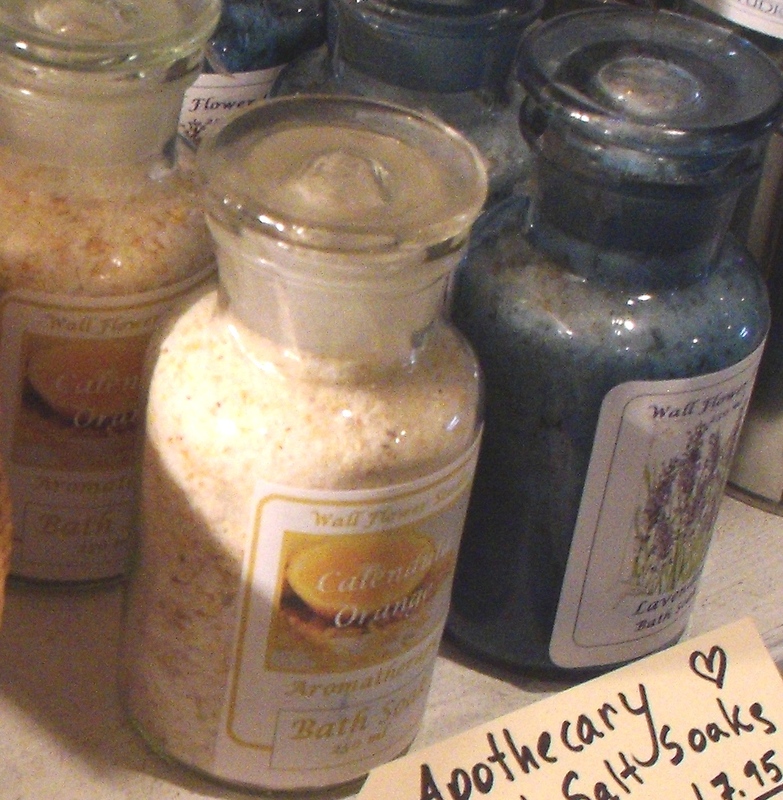 Relax all your cares away in a hot bath with all the essential ingredients contained in these bags. It’s especially nice after a long day in the garden. Dried lavender flowers release essential oil and fragrance into the bath. The sea salts dissolves and works to relax tired and sore muscles. Milk powder dissolves to condition skin. The best thing is that rejuvenated feeling after a good soak. There is no mess of dried flowers to clean up – just pick the tea bag up to discard. I put mine in the composter. You can buy empty tea bags, fill them with herbs and iron them shut! I love the fact that you can choose your own natural ingredients. Nothing harmful to the body or the environment. Lavender, mint, sage, basil, chamomile, or anything that strikes your fancy, can be added, then ironed shut and tossed in the bath! It’s that easy. Here’s a recipe I’ve used for many years. Hope you enjoy it too! ~1 muslin bag (or) empty heat sealed tea bag or pretty jar with lid. 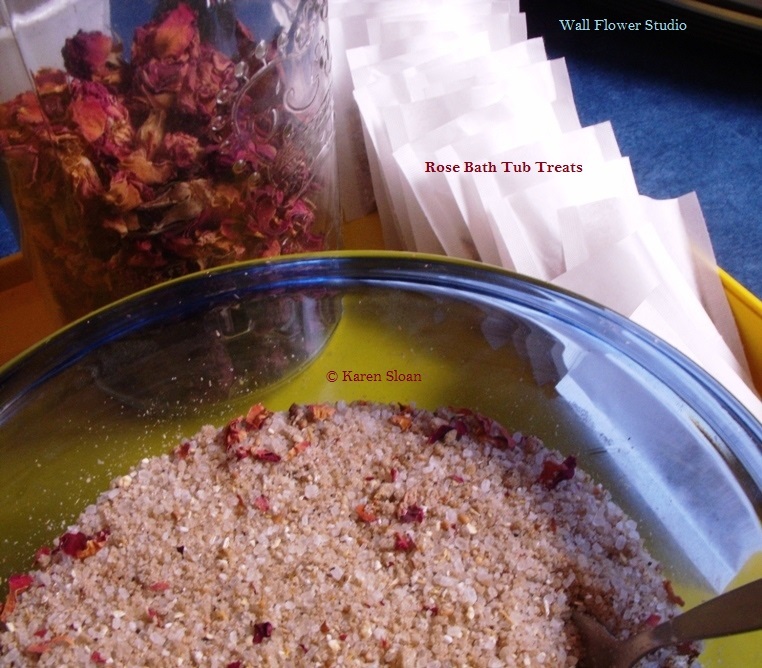 ~Mix the dried flowers/herbs in the blender which helps to release their essential oils. ~Add a few drops of essential oil with a half cup of Epsom salts. ~Mix well and fill your muslin cotton sachet or tea bag and seal it. ~Hang the muslin bag from the spigot on your tub, or just float the bath tea bag in the tub for a few minutes before you get in. It’s that easy! Enjoy! 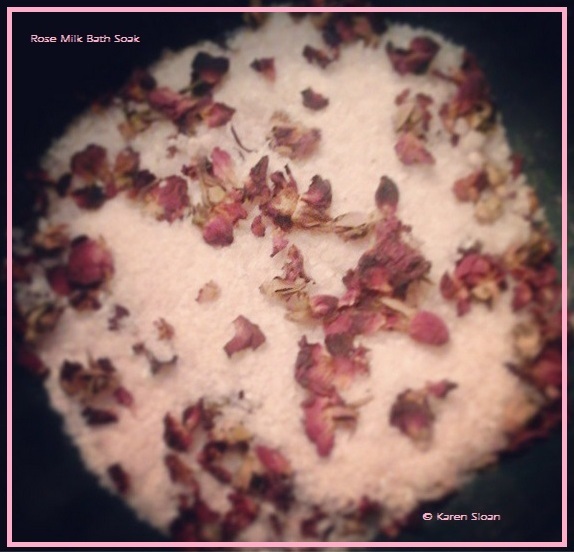 If you’d like to try some, but don’t have the ingredients or the time, please feel free to visit my Etsy shop where I have Bath Tea Spa bags available, and many other great gifts from the garden. Wall Flower Studio ships worldwide. Thank you!